I am a parent which means part of me lives for my children. That same part lives through all the other parents that have gone before me. I am a man which means that I am a son. I am a human which means I am flawed and emotional and a force of love. All that I am is heavier thinking of what happened to Trayvon Martin. And nothing that I am is surprised. He was a boy killed because of fear and ignorance and hatred and emptiness. Just like Emmett Till and Michael Griffith and Yusuf Hawkins and countless others in this country and around the world and throughout human history. There are 7 billion of us on this planet just right now. I can’t imagine how many mothers and fathers have mourned their children the way Trayvon’s parents mourn him today. Killed for nothing. This isn’t to diminish the gravity of what that family is going through right now. Quite the opposite. This is to amplify its affect on all of us for it seems this is who we are. This story leaves a hole in me, just as all stories like it do. And it makes me wonder about us. 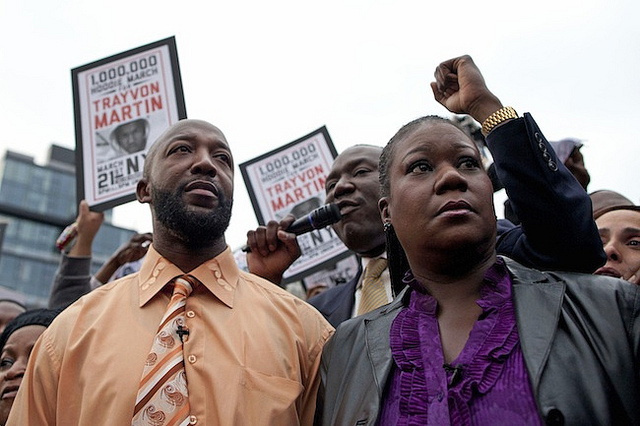 I saw the video of Trayvon’s father speaking at a rally in New York last night. My girls were sleeping in the other room with a spring breeze blowing through their open window and I listened to him talk about losing his son. He talked about how they were all there to try to stop any other parents from having to feel what he and Trayvon’s mother felt. Listening to him I thought of the moment they found out their son was dead. I thought of what my daughters might be dreaming about. I thought of what Trayvon might have thought about in his last moments here. And I couldn’t help thinking that his father’s words will be heard again and again, said by different mothers and fathers, over and over. Words that no rally or speech or song can stop from coming. His words are the echo heard from a million other parents, an echo that will last as long as we do. Still, his words matter. His words are the counterweight to the hatred that killed his son. His words help to keep us in balance. When I wonder about us and how we could be capable of such things I am reminded of what else we are capable of. I have a good friend with a sign on his truck that says “I love you. I am another you.” I have another friend that drives around in a pink motor home called the Hugmobile with “The world would rather hug you than hurt you” painted on the side. Theirs are lives dedicated to love in this world that has moments dedicated to hate. Love doesn’t remove hate. Love balances hate. And love exists because of hate. We are capable of unbelievable evil and we are capable of infinite love. We are the only species that kisses with our lips and the only one that wages war on each other. We create and we destroy. And we do it all endlessly. We are so much and so little all at the same time. I don’t have any answers to the ache that comes with something like a boy being killed for nothing. There aren’t any answers and there isn’t an end to the pain of such stories. They are a part of who we are, as horrible as that feels to put into words. But we are also the opposite of that. We are infinite love. That will always be a part of who we are, too. Agreed. A million times over my friend. I think it is the Talmud that says one child is the whole world. When one child dies, it is as if the whole world dies. It certainly feels that way, doesn’t it. Thank you for taking the time to share that, sir. Nice job Mitchell! We are all one. What happens to one of us affects us all. If you want love, you must BE love. Spread it out….scatter it about…lips and all. Well said, Maggie. Thank you. Great entry, Mitch. The darkness seems SO dark at times like these. Sometimes I feel foolish waving my flag of pink in the face of it. But I try to have faith – that shining light is the best to stop the dark. Love to you are your family. Thank you, John. I am very glad that you are waving your big, pink flag. That is one of the things that helps me to have faith. Love to you, too, my friend. “Love doesn’t remove hate. Love balances hate. And love exists because of hate.” So profound and so true. Wonderful post. Dude… great story. And I walk by that Hug Nation motorhome every time I walk by 5 year old to school! How random that you guys are friends (or maybe not…). Thanks, Matt. That is great that you walk past Huggy so often. Sadly, news of the old girl’s future is bleak – but she has had a good ride. Thankfully, John continues on with great passion and I truly believe we are all better for it. If you should happen to see a man walking around in that area with hot pink hair, go give him a hug for me, will ya?